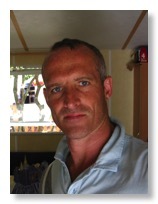 Graham Beynon was minister of Avenue Community Church, a church plant in Leicester. He is also the Course Director for ‘TEAM’ (Training for East Anglia Ministry). He previously worked for churches in Leicester and in Cambridge. Prior to full time Christian ministry he was an audiological scientist working with hearing and balance disorders. He studied theology at Oak Hill Theological College, London, UK. He is married to Charis and they have three children - Cara, Isaac and Jed. Living in the light of the Future. What does Graham sound like? What books has Graham written?